Following the approval and ratification of the basal boundary GSSP for the Holocene Series (see below), there have been discussions about the possibility and usefulness of formally defining subdivisions of the Holocene. This was last considered by the INQUA Holocene Commission’s Working Group on the chronostratigraphical subdivision of the Holocene, which was constituted in 1977, and whose findings were reported in a Special Issue of Striae edited by Mangerud, Birks & Jäger (1982). During the course of those deliberations, various Quaternary scientists were contacted and invited to contribute a brief review of the Holocene chronostratigraphy for particular geographical areas. Twenty one contributions were received, in which a range of approaches to establishing chronostratigraphical subdivisions of the Holocene were reviewed and the advantages and disadvantages of each of these discussed. After careful consideration, the Executive Committee of the Working Group came to the view that formal definitions of stratotypes sensu International Stratigraphic Guide did not, in the light of the available evidence, appear practicable for the Holocene. They concluded that ‘within the Holocene it is clearly possible, and in the opinion of some also desirable, to work without any chronostratigraphical subdivision, and simply express the ages in radiocarbon years. If an actual subdivision is wanted, definition of the boundaries in terms of radiocarbon years seems, at present, the most practical approach. These two approaches are broadly similar in their aims, and also in their requirements as estimates of the radiocarbon age of the sediment concerned are essential’ (Mangerud et al., 1982, p 6). And there to all intents and purposes, the matter has rested. But with the recent progress that has been made towards a formal subdivision of the Pleistocene Series, it is now the case that the Holocene is the only geological unit of Series status that remains undivided, and hence it may be timely to revisit this matter. Accordingly, a new Working Group has been constituted, again, as with the Holocene Boundary Working Group, this being a joint body of the SQS and the INTIMATE (Integration of ice-core, marine and terrestrial records) group. The remit of the new Working Group is to examine the evidence for or against a formal subdivision of the Holocene Series. Of paramount importance will be the usefulness of any subdivision for the wider Quaternary community; there is, after all, nothing to be gained by creating subdivisions that have little or no practical value. Reference: Mangerud, J., Birks. H.J.B. & Jäger. K. D. (1982). Chronostratigraphical Subdivisions of the Holocene. A review. – ln Chronostratigraphical Subdivision of the Holocene (Mangerud, J., Birks, H.J.B. & Jäger. K. D.. Eds). Striae, Vol. 16, pp. 1-6. Uppsala. ISBN 9I-7388-033-7. lSSN 0345-0074. The Holocene GSSP was formally accepted and ratified by IUGS in May 2008. Download; voting details, confirmation letter from IUGS. 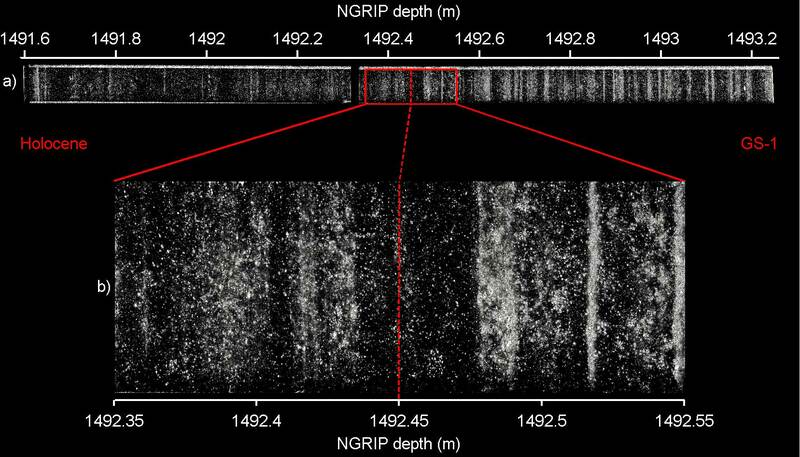 The visual stratigraphy of the NGRIP core between 1491.6 and 1493.25 m depth obtained using a digital line scanner (Svensson et al., 2005). In this photograph, the image is ‘reversed’ so that clear ice shows up black, whereas the cloudy bands, which contain relatively large quantities of impurities, in particular micrometer-sized dust particles from dry area in eastern Asia, appear white. The visual stratigraphy is essentially a seasonal signal and reveals annual banding in the ice. The location of the Pleistocene-Holocene boundary at 1492.45 m is shown in the enlarged lower image. A core break occurs at a depth of 1492.32 m. The ice core is complete and continuous across the core break, but the visual stratigraphy scanning image is disturbed by the break and has thus been masked out (photograph by Sune Rasmussen). Click on image to see enlarged version. Full details are published in the Journal of Quaternary Science, issue 1 2009.